Former Vice President Joe Biden, and other Democrats had already called any expectation or requirement of showing voter identification….racism and voter suppression, as they said that such expectations silence legal voters. However, is the expectation of a voter being able to show a state issued id, a driver’s license, a military id, or some other form of identification truly voter suppression? Democrats claim that the poor and minorities throughout America are many times unable to get such identification cards, due to financial circumstances. However, those very same lower-income individuals and minorities are able to get food stamps, welfare, buy cigarettes and alcohol, certain over-the-counter medications, and other items that ALL REQUIRE IDENTIFICATION WITH PICTURE ID. So does that mean that the Democrats are suppressing the Medicaid and Welfare rolls? Does that mean that they are discriminating against the poor and minorities in trying to stop them from buying cigarettes and alcohol and medicines? ABSOLUTELY NOT, BECAUSE IT IS OBSURD. In fact, it is NO MORE OBSURD THAN CALLING VOTER ID ‘VOTER SUPPRESSION’ AND ‘DISCRIMINATION’! So does that mean that voter suppression doesn’t happen? Absolutely not! It comes in a multitude of forms, and Democrats and their Mainstream Media allies have dressed up the real voter suppression as a ‘War on Fake News’. In fact, Breitbart News revealed that the largest voter suppression came from ‘Big Tech’ giants like Facebook, Twitter, Google, and other platforms that have found that by de-platforming American voices that oppose their own political ideological beliefs, they can control the narrative, and ultimately the thoughts and beliefs of the American people. Therefore, they can narrate the American psyche. The truth of the matter, involves not voter suppression, but INFORMATION SUPPRESSION, as left-wing online platforms like Facebook and Twitter ban conservatives, or anyone who dares oppose their Progressive-Socialist ideological slant, while ‘free-speech’ platforms like Gab.ai are deemed ‘racist’, not because they promote racism, but because they refuse to censor anyone, unless they break the law. Even just this week, the National Public Radio (NPR) falsely accused Donald Trump Junior of lying in his Senate testimony, despite evidence showing otherwise. Regardless, other networks took it as fact, and publicly berated the Presidents son, regardless of facts, and without verification of facts. In addition, they sought to manipulate search results, in order to affect various American and worldwide opinion, concerning various aspects of the Presidents agenda like his travel ban, and border security. According to reports coming out of Google, their PRIMARY OBJECTIVE…. To find ways that Google could STOP THE PRESIDENT FROM WINNING AGAIN! Therefore, in their utter hate for the President, and their fight to replace our nations Constitutional Republic with a Global Socialist Republic, Democrats and their Mainstream Media and Tech Giants allies are suppressing information, so they can suppress the vote, so they can ‘control the will of the people’, and control the outcome of elections. Democrats and the Mainstream Media claim to be in favor of stopping ‘voter suppression’. They claim to be fighting for ‘truth and justice’. They claim to be fighting against so-called ‘FAKE NEWS’! However, ALL THE EVIDENCE points to the fact that it is not those whom they seek to silence, in violation of the First Amendment, but it is the Mainstream Media and Democrats who are not only perpetrating the ‘REAL FAKE NEWS’, but they are fighting to ‘END THE FIRST AMENDMENT’, in their quest to end free speech, and a free press. Two of the outlets that Google sought to silence included both ‘The Daily Caller’, and ‘Breitbart’, especially after President Trumps election shocked the organizations staff, who thought Hillary Clinton had the win. Google even went past their attempted silencing of the media, and went after the American voters. In fact, they even went after the women’s voting bloc who voted for the President and conservatives. In fact, they wrongfully added the title “Enablers”, to the search labels for Republican Women on their platform. Google has also taken fire for labeling a Republican women’s group as “enablers”, listing the California Republican Party’s ideology as “Nazism”, and after President Trump announced his 2017 travel ban, Google employees detailed ways to manipulate search results in order to push back against the president’s order. Google even tried to devise ways to have search results for “Islam, Muslim, Iran, Mexico, Hispanic, Latino, and other unbiased terms” come up as racist, prejudiced, and biased, if they are connected to conservative or pro-Trump ideology. After virtually every election, Democrats go-to explanation for why they didn’t win X state or Y district is “voter suppression.” The midterms were no different — but the complaint was particularly egregious, given that it occurred on the back of outright election meddling from Silicon Valley. Still, that was still just a part of the Progressive-lefts’s discriminatory and hate-filled bias, as well as voter suppression towards opposing ideology. Meanwhile, Google is far from un-biased, as in 2016 they supported the bussing in of Latino voters to the polls to drive democrat turnout. However, it backfired when many of those Latinos ended up voting for Trump, according to a series of leaked emails from Google itself, thus demonstrating the shock and dismay of Google employees. 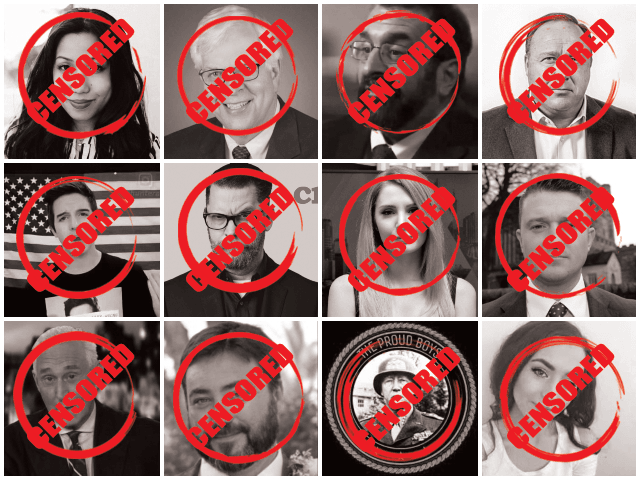 Still, Google continues to silence opposing ideological voices…especially the top voices like Roger Stone, Tommy Robinson, R.C. Maxwell, and Gavin McInnes, James Woods and Laura Loomer. Facebook also banned over 800 pages and accounts, just before the 2018 election, and thousands more since President Trump took office in 2016. However the Facebook bans targeted conservatives, and the anti-Establishment Facebook owners like triple amputee and Iraq war veteran Brian Kolfage, who invested some $300,000 in his Facebook businesses. Also, Tommy Robinson got banned from all tech platforms for SIMPLY REPORTING FACTS that exposed the hate coming from the left.When confronted about Facebook’s bans…aka censorship, Facebook said that their crackdown as an effort to “protect” elections from “misinformation” and “inauthentic behavior.” However, if that were the case, every ‘Mainstream Media’ outlet would have a ‘LIFETIME BAN’ for applauding “AntiFa” terrorists, encouraging violence against conservatives and pro-Trump MAGA fans, doxxing political opponents, and other either violence, hate-speech, or other progressive-Socialist encouragement of violence and hate. Therefore, although the big-tech platforms claim to be working to ‘protect’ Americans from fake news, they are actually suppressing real news, and promoting ‘Fake News’ on their platforms. However, despite the lies and misconceptions on Facebook, Twitter, Google, and other platforms, Social Media should not be shut down or censored themselves. However, they should be held to the same standards as phone companies and other forms of communication. They should not be able to silence opposing ideologies, or promote one ideology over another. Especially since they have become a primary way for Americans and societies around the world to stay informed. They are not a publisher, but they are also not a watchdog. They were designed to be free speech platforms like Gab is today, but most platforms have become not a form of policing agency, but a watchdog who suppresses free-speech and honests-speech that comes from the conservative and ‘Make America Great Again’ ideology, and promote socialist, communist,and progressive ideology that the democrats now embrace. Therefore, regardless of the outcry by the progressive-left about Republican ‘voter suppression’, it has actually been the progressive-left who have openly taken one of the founding principles of our Constitutional Republic that was envisioned and implemented by our Founding Fathers…’Free Speech’, and ‘Freedom of the press’! Democrats claim to ‘voter suppression’ is loud, yet amongst all their screams and cries, there has not been any evidence of actual ‘voter suppression’! They point to a machine or two that failed, or claim that requiring proof of being the actual voter suppression, yet when votes are manufactured by Democrats that change the outcomes of election after election, like in 2018 in Florida, or California…’Crickets’. Then, they call the silencing and censorship of half of America, at least the conservative half, a “conspiracy theory,” despite Facebook, Google, and Twitter openly admitting their censorship to Congress. I was as shocked as anyone to see the State Elections Board, in an unprecedented bipartisan 9-0 decision, delay certification of our election results. Our democracy depends on fair elections. I’ve issued the following statement. The Heritage Foundation said that the Democrat would have to file formal charges with the House Administration Committee, and their decision would then go to the Full House, and then the Full House under Nancy Pelosi would have the final say. In all, Democrats and their Mainstream Media and Big Tech allies like Facebook, Google, and Twitter will continue to shape the outcome of elections by suppressing free speech, and shaping the news that Americans receive. Already, colleges and universities have become institutions of anti-American, anti-Capitalist propaganda, as they have shaped generations of children into the socialists and communists of tomorrow. There are still a few bastions of free thought, free speech institutions who allow children to think for themselves, but they are on the verge of extinction today. Combine that with the fact that those educational institutions have planted those thoughts in the minds of their students who now own multi-national corporations, Mainstream Media outlets, and throughout our government today, freedom and our representative democracy is also on the verge of extinction. In fact, with the aid of Democrats like Senator Durbin (D-IL) and their socialist allies throughout our tech industry, media industry, educational systems, governmental systems, and corporate America, they are propelling us into a banana republic, as our constitutional rights and laws are being ignored and shredded. After all, as non-Progressives, non-Socialists, and non-Communists plot and initiate their targeted campaign to eradicate the resistance to their left-wing ideology of hate and discrimination, Americans would do good to realize that not only is their attempted overthrows of our election systems a threat to our nation, but it is a threat to our way of life. Democrats may call it Republican Voter Suppression, but it’s not. Instead, it is Democrats and their Mainstream Media co-conspirators, as well as tech-giants voter nullification, as Demcorats not only look to overturn Florida, California, and North Carolina election results, but they look to overturn our Constitutional Republic. I got what you mean , thanks for posting.